A Year of Being Here: Dana Yost: "A New Approach"
that left you where you are today. a few feet in front of you. "A New Approach" by Dana Yost. Originally published in The Awakenings Review (Spring 2011). Presented here by poet submission. 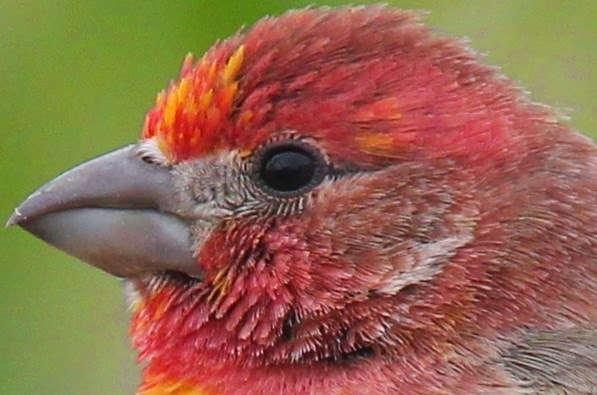 Art credit: "House Finch male variant," photograph taken in Baja California Sur, Mexico, by Chris and Debbie Llewellyn. Oh, this is good in ways I can't even articulate yet! I cherish the image of the therapist's hand-drawn crucifix, while finding it (how shall I say?) strange, but enthrallingly so! Thank you for all you do to delight the wee hours of this often sleepless reader! While I'm very glad you're enjoying the poetry, I wouldn't wish sleeplessness on anyone. Be well!